Perini design ingenuity at the utmost, S/Y Luna was truly unique for her time – and arguably still remains so today. Three decks in a volume with barely a superstructure above deck. Outdoor dining and lounge area in a huge Forward Cockpit. And true privacy for Owner and Guests with crew access from the transom to the crew quarters. An existing Perini Owner appreciated the unique potential, commissioning the Family’s second Liberty – with rich cherry interiors adorned with magnificent antique furniture to contrast her casual tone. One of the most successful charter yachts of her time – and inspiration for another sailing family who would build the 56m Salute following their charters aboard Liberty. 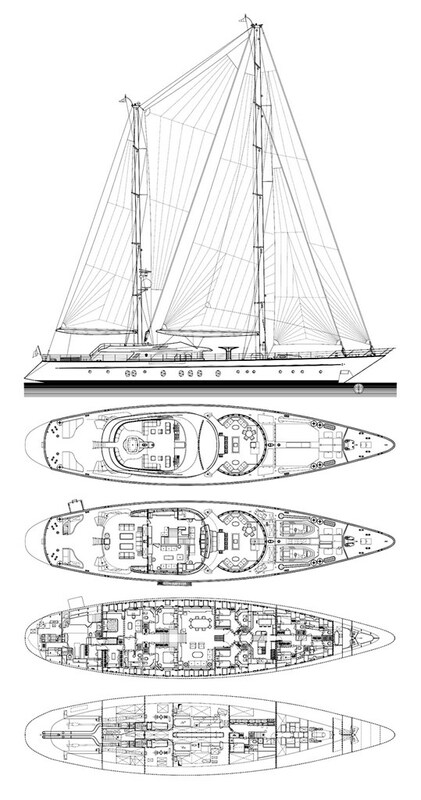 The luxury sailing yacht Luna was built in 1997 originally as Liberty and is well known by her original forward cockpit. She is one of the shining examples of Perini Navi pedigree, combining unique design and performance with luxury amenities. Luna offers great spaces for outdoor living and dining. On the main deck there is a large aft cockpit lounge area which can also be laid out for alfresco dining, and her unique feature forward of the wheelhouse is the forward covered cockpit lounge. Her sun deck features a large spa pool and ample sun beds where you can enjoy drinks and snacks alfresco.